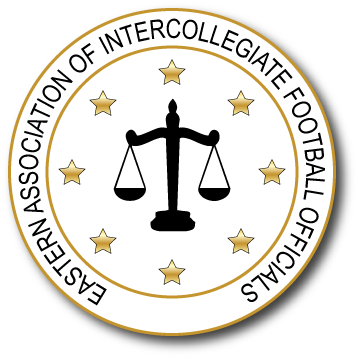 The Eastern Association of Intercollegiate Football Officials (EAIFO) is a group of more than 600 members in 7 regional chapters who officiate college football at the Division I (FCS), Division II, Division III and Junior College levels. We service independent schools and conferences across the Northeast and Mid-Atlantic states. As a leader and innovator in officiating since our founding in 1945, the EAIFO boasts more members who have gone on to work in the National Football League than any other officiating organization anywhere in the world. We have a strong focus on the development of new collegiate officials and provide an unparalleled training program where developing officials receive feedback from accomplished Division I (FBS and FCS) officials. If you’re interested in applying for membership in the EAIFO, please visit the website of the regional chapter closest to you for more information.